"The Elves and the Shoemaker," is a funny little story about a man and his shoes. A shoemaker and his wife are terribly poor, and just do not know how they will make ends meat anymore. The shoemaker has one last strip of leather to make some shoes bright and early the next morning, so he lays them out to go to sleep. When he wakes up the next morning, he realizes that the shoes have already been made...but by whom? Every night after that he lays more pieces of leather, and every morning he wakes up to more pairs of shoes. Who is the mysterious person making his shoes for him every night? Reading fairy tales from beautifully illustrated books is a wonderful experience for young children, however don’t forget or underestimate the value of just telling these stories to your children. First of all, when you tell the story, you can adapt the story to the age and attention span of your child. Second, children need oral stories to help them develop their visual imaginations. 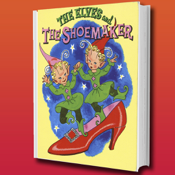 At the end of the story you will find A set of flashcards featuring words and images from The Elves and the Shoemaker, ideal for helping to build up vocabulary and support understanding.